Motor City Pride parade, June 11. Detroit — Motor City Pride was held at Hart Plaza in downtown Detroit on Saturday and Sunday, June 10-11. Some of the event’s activities included live performances, an underground dance hall, vendor booths, food trucks and the Pride parade, which started off the day on Sunday. Workers World Party’s Queer Liberation Contingent included activists from WWP, the Moratorium NOW! Coalition, the Michigan Peoples Defense Network and the Detroit Active and Retired Employees Association. As we marched in the parade behind Bank of America workers, our signage and chants reflected an anti-capitalist stance. 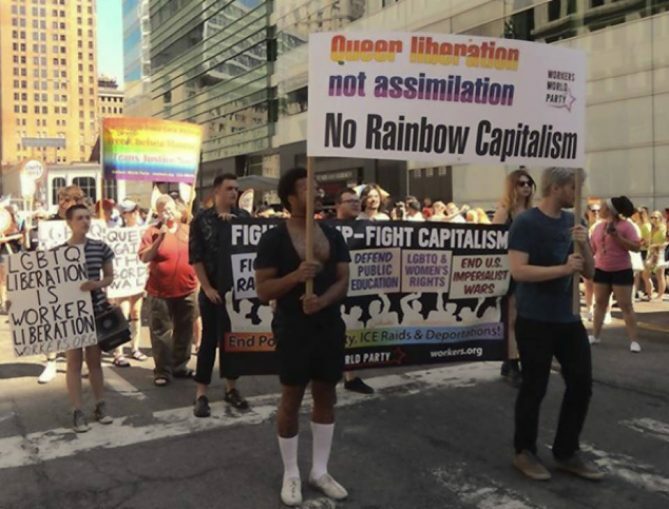 One popular banner read “Queer Liberation, Not Assimilation! No Rainbow Capitalism.” Chants like “Queers can’t live on fast food wages!” and “Detroit, we’re queer, immigrants are welcome here!” were met enthusiastically by people gathered on the sidewalk, who often clapped and joined in the chorus. Pride-goers were very receptive to the WWP booth and took interest in our June 17 forum on “Queer Liberation and Socialism.” In fact, the majority of people who approached the table expressed an interest in socialism. People filled at least six or seven pages signing up for the WWP email list. Additionally, we sold a variety of LGBTQ literature, such as “The Roots of Lesbian and Gay Oppression” by Bob McCubbin and various works by Leslie Feinberg, the WWP leader who helped trailblaze the political understanding of the origins of transgender oppression and how to fight back. Books like “The Communist Manifesto” were also sold. As the only Marxist organization present, Workers World Party brought revolutionary ideas to an event that otherwise would not have had this important political commentary.